In the February 20, 2016 issue of His Excellency Bishop Williamson’s Eleison Comments, it is announced that Dom Thomas Aquinas, Prior of the Holy Cross Monastery in Nova Friburgo, Brazil, will be consecrated a bishop on March 19, 2016, Feast of St. Joseph, at the same monastery. Deo gratias! I believe that Dom Thomas Aquinas is a good choice as he has proven himself over many years to be a warrior of Catholic Tradition and faithful follower of the saintly Archbishop Marcel Lefebvre. I do hope, however, that he will publicly espouse the red light position, unlike Bishops Williamson and Faure who have more or less adopted the yellow light position. As I proposed in this post, the yellow light position has debilitated the growth of the Catholic Resistance; the red light position will bolster it. Please keep Dom Thomas Aquinas in your prayers. December 8, 2015 has come and is coming to a close. There has been much hype amongst Traditional Catholics that this might have very well been the day that the neo-SSPX would officially announce a canonical agreement with Rome in the form of a Personal Prelature. It is 8:00 p.m. Eastern Standard Time – the time of the writing of this post; no announcement will be coming forth this day. What does this lack of announcement mean for yellow lighters, that is, those Resistance clergy and faithful that for now reduce the acceptability of attending neo-SSPX Masses to the quality of the individual neo-SSPX priest? Well, they will just have to wait longer before red lighting neo-SSPX Masses as the announcing of a canonical agreement is the red line that most Resistance clergy and faithful have drawn. These yellow lighters, however, may very well be yellow lighting for some time to come. Meanwhile, after three years and still counting, the Resistance movement has not gained much ground and is now weakening before our very eyes. The yellow light position is wishy-washy. It keeps neo-SSPX priests and the faithful that have never stopped attending their Masses from leaving the neo-SSPX and consequently keeps the Resistance from growing. On the other hand, as time drags on with the neo-SSPX and Rome continuing to negotiate, but without reaching a canonical agreement (or at least not announcing one potentially already signed), most Resistance priests maintain the yellow light position until an agreement is announced. Meanwhile, some yellow light faithful get weary of the fight and/or become gradually absorbed into the neo-SSPX mentality causing them to permanently reintegrate with the neo-SSPX. I would not be surprised if even red light faithful become negatively affected by continuous attendance at the Masses of yellow light clergy. Furthermore, the yellow light clergy themselves are susceptible to soften as time goes by. Unfortunately, the yellow light position proposes that the woman (neo-SSPX) is still available to other men (priests and faithful) because a marriage has not yet taken place or that the bride (neo-SSPX) is still available to other men (priests and faithful) because the marriage has not yet been consummated. Sigh. If we want the Resistance movement to (re)gain ground, I believe red lighting will give it a boost that it dearly needs. As with the catholic Roman soldiers who were inside the organization and garrison of the Roman institution, they could not effect the line of thinking handed down to them from their leaders; they were either transferred, expelled, or killed. Nicodemus could not effect change either being inside. He could only be a ‘secret’ follower of our Lord. Our Lord was the greatest example of being a ‘red lighter’. While recognizing the appropriate authority, He made the change from being on the outside of the hypocritical environment in order to freely preach the True Faith His Father gave to Him to uphold and to instill in the minds and hearts of the people. To see, hear, and understand our Lord, this required the people to leave the compromised environment also in order to find the Tree of Life. Such was Archbishop Lefebvre’s faith and leadership to encouraging Catholics to get OUT of the compromising and dangerous environment. Some heeded his wisdom; some did not and then became the worst haters of tradition they said they wanted to hold fast to. There is no such thing as an internal resistance within a den of compromise. We are not meant to serve an institution over the faith; institutions exist to serve the faith. These neo-priests and people need to find their priorities and hold a conviction on the power of the Cross and not on the power of men. On July 7, 2015 the Dominicans of Avrille published a position statement in regards to the SSPX. After reading it, I must say that I was disappointed. This position statement demonstrates the wishy-washiness of the yellow light position. I would expect by now, after the tsunami of evidence gathered over the last three years of the new direction of the SSPX under Bishop Fellay, that the Dominicans would come to hold the more logical and conclusive position, that is, the red light position. Below are my comments in red font in response to parts of the Dominicans’ position statement, which is in blue font. The position of the Friary has not changed since the foundation of our community, that is,we continue the combat for the Faith summarized perfectly by the Doctrinal Declaration of Archbishop Lefebvre of November 21, 1974. What? First of all, Bishop Fellay, Superior General of the SSPX, no longer holds to the doctrinal and practical positions you’ve just outlined above, so how can you still declare that your friary is not in rupture with the SSPX? 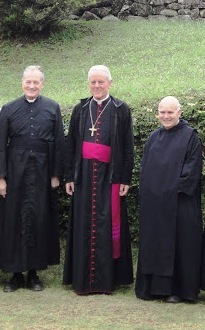 Secondly, the priests who remain publicly silent allow Bishop Fellay to publicly represent their position. How then can they be said to “continue the good fight in this spirit”? The internal resistance is dead. They will not change Bishop Fellay’s direction. The time for internal resistance is long gone. Priests such as Fr. Joseph Pfeiffer and Fr. David Hewko continue the combat of Archbishop Lefebvre, including the doctrinal and practical positions you’ve outlined above, whereas the SSPX under Bishop Fellay no longer does. How then can you not “take sides”? The SSPX has not only collapsed. It is dead! “Combat for the Faith” is good, but Bishop Fellay now accepts Vatican II in the light of Tradition, so he is no longer combating for the Faith. And the overwhelming majority of the SSPX priests are going along either by their explicit approval or public silence. Therefore, the Dominicans should declare a “rupture” with the SSPX and adopt the red light position. 1. Abp. Lefebvre, Letter to Pope Jean Paul II, 2 June 1988. “And we must not waver for one moment either in not being with those who are in the process of betraying us. Some people are always admiring the grass in the neighbor’s field. Instead of looking to their friends, to the Church’s defenders, to those fighting on the battlefield, they look to our enemies on the other side. “After all, we must be charitable, we must be kind, we must not be divisive, after all, they are celebrating the Tridentine Mass, they are not as bad as everyone says” but THEY ARE BETRAYING US – Betraying us! They are shaking hands with the Church’s destroyers. They are shaking hands with people holding modernist and liberal ideas condemned by the Church. So they are doing the devil’s work. (Two Years after the Consecrations, Address to Priests in Econe, Switzerland, September 6, 1990). One can safely say that many in the current SSPX leadership fit into the category of people that Archbishop Lefebvre condemned in his statement above. However, what can one say about those SSPX priests who do not agree with the current SSPX leadership’s position, but refuse to publicly speak out against the new direction? Would Archbishop Lefebvre condemn them too? In order to make a fair assessment, I think that one really needs to answer this question: Is the public silence of the SSPX priests regarding the public liberalism of their leadership a betrayal of the Faith? I answer in the affirmative. Without getting into subjective judgements of the souls of any SSPX priests (or laymen), the following is my argument. One does not have to positively accept or actively promote a liberal idea in order to be a traitor. A soldier that allows the enemy in because of fear for his life is still a traitor, albeit to a lesser degree than a soldier who accepts money to let the enemy in. The essence of the two acts are, nevertheless, the same. Furthermore, by the priests’ public silence, they allow their leadership to publicly represent their stance (e.g., the April 15, 2012 Doctrinal Declaration, the 2012 General Chapter Six Conditions, etc.). To illustrate the importance of this point more clearly, here is an example. If I were a member of a political party that was pro-life in its policy and then the leadership of the party convened and changed the policy to pro-abortion without requiring me to sign anything in agreement with the new policy but requiring me to not publicly oppose the new policy under the threat of being kicked out of the party, would it be morally licit for me to keep quiet? No. I would be morally obligated to publicly speak out. What if, however, the policy was not changed but the leadership began and continued to publicly show leniency towards abortion despite private protests to retract the leniency; would it now be morally licit for me to keep quiet? No. I would still be morally obligated to publicly speak out. In either case, my public silence would be a betrayal of the pro-life stance regardless if I am personally, perfectly pro-life and never positively speak or display otherwise. The same line of reasoning, then, is applied to SSPX priests who remain publicly silent on the liberalism of their leadership. What about the layman who assists at Masses of these SSPX priests? Well, given the betrayal on the part of the SSPX priest, even if he were otherwise doctrinally orthodox and even if one’s own Faith is not placed in harm by attending his chapel, to actively unite in the greatest act of worship with a priest who remains publicly silent in the face of the public liberalism of his leadership is a co-operation, on the part of the layman, in that act of betrayal. Why? We are not speaking here about the layman simply enjoying a cup of coffee with such a priest; rather, we are speaking about the layman uniting with a priest, who is representing himself as an alter Christus in the most eminent degree, in that greatest act of worship (i.e., the Holy Sacrifice of the Mass) which itself is the most magnificent and ultimate expression of that Catholic Faith that the priest, nevertheless, fails to publicly defend in the face of the public liberalism evident in his own backyard. The layman, by actively uniting with the priest in this greatest act of worship (which again is the magnificent and ultimate expression of the Catholic Faith), implicitly admits the moral uprightness of the priest in regards to the Catholic Faith in both the priest’s public profession and public defence of the same Catholic Faith. Furthermore, by the fact that the priest’s leadership publicly betrays the Catholic Faith and that the priest remains publicly silent on this betrayal, the priest allows his leadership to publicly represent his stance in regards to the Catholic Faith. Therefore, the layman also implicitly admits the moral uprightness of the priest’s leadership in regards to the Catholic Faith in both the leadership’s public profession and public defence of the same Catholic Faith. This co-operation in the betrayal, on the part of the layman, is the case even if the layman publicly speaks out against the public liberalism of the priest’s leadership because the act of the layman’s actively uniting in the greatest act of worship with the priest undermines the layman’s own stance. As the saying goes, “Actions speak louder than words.” Therefore, it is an act of hypocrisy and of compromise on the part of the layman. They are focussing on what is being taught – no current teaching error, therefore no problem. With this line of thought, the logical conclusion is that it is then permissible/required to go to Indult Masses, as they too do not currently teach error and do promote the Tridentine Mass. If this is sufficient, then there is no state of emergency, so there is no reason for the SSPX to exist. There are plenty of groups available within the structure of the Modern Church to meet this preference. A further point that we can make is that the individual SSPX/Indult/NO priest, who may be personally solid, by staying within the organization represents the policies/principles of the organization. So, although the SSPX priest may be against the organizational policies/procedures, he still represents acceptability of 95% of Vatican II, acceptance of the new Code of Canon Law, NOM’s being legitimately promulgated (and therefore legitimate), etc. The modern SSPX no longer passes on the fullness of the Teaching of the Catholic Church, partly by omission and partly by distorting the teachings of their founder. The fullness of the Truth is no longer sought, but a practical agreement becomes the target. Lessons learned through observance of the many other Indult groups are ignored. Modernist Rome is considered trustworthy enough to be obeyed without criticizing their errors. These participants, however, are not focussing on what is not being taught – omission of teaching about what doctrinal and pastoral errors are present in the Modernist Church. Thus, by not warning their flock of these errors, the SSPX is in fact condoning these errors. The average adherent then thinks that everything in the Church must be acceptable, otherwise Father would be warning him. The SSPX thus becomes guilty of sins of omission by condoning these errors; the adherents are at risk for what they are not being taught. The decision to continue to attend the Masses/Sacraments is defended as claiming that they are still valid and are the normal means of Grace, therefore it is sinful to stay away from them. What is not considered is that God is not limited to normal means. If our Faith is at risk due to the factors noted above, then it is imprudent and sinful to accept these normal means from the compromised SSPX. We might as well go to the NOM, if it is legitimately promulgated and thus is itself the normal means. We conclude then that this line of thinking is flawed and that one cannot continue to consider the SSPX Masses/Sacraments of being worthy of a yellow light, but must be considered as worthy of a red light.